The Trojan Women Project sends artists from the Great Jones Rep to communities worldwide to work with actors, musicians and designers in re-creating the music and staging of LaMaMa's groundbreaking production of The Trojan Women, first produced by Ellen Stewart in 1974. The Trojan Women is an old story - the play is more than 2500 years old. But its themes - war, displacement, violence against women and children, genocide - continue to be relevant throughout the world. For this reason, The Trojan Women Project seeks to engage with communities where there is a recent history of conflict, and a desire on the part of these communities to use theater as a means of addressing contemporary issues. Using the text, music, and scenarios originally developed by Elizabeth Swados, Andrei Serban and the Great Jones Repertory Company, workshops focus on the exploration of sound and gesture. In rehearsal, actors and musicians are encouraged to incorporate their own instruments, music, dance and design elements into the production. 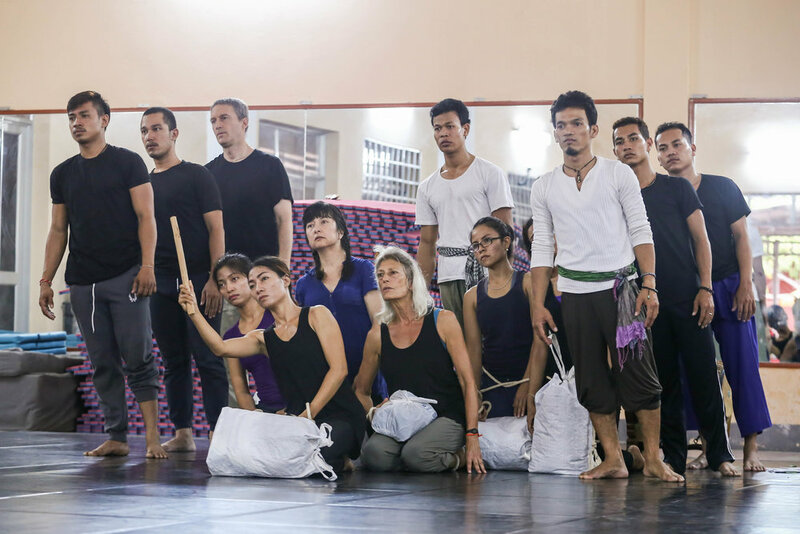 The workshops and rehearsals lead to performances for their communities, after which the production remains with the participants to use as they wish in their future work. The Trojan Women Project grew out of a desire to share this particular way of working which began in the late 1960’s at LaMaMa and culminated in the The Trojan Women. Using a mix of ancient and indigenous words and phrases, the composer Elizabeth Swados created a new, non-literal language. Meaning is transported through sounds, rhythm, music and gesture. Andrei Serban’s staging physically involved the audience throughout the piece, turning them into participants and witnesses, not just spectators. The production has been performed in more than thirty countries throughout Europe, Asia and the Middle East. For performers, musicians and audiences over the years, it has been an extraordinary experience. We believe it is time for a new chapter. There is something about this way of working that opens up voices, bodies, and our imagination to create a space, a shared space, where we can experience the story beyond words, making room for individual stories and histories to resonate. Ellen Stewart spent her life bringing people together with theater, dance and music. She crossed borders, opened doors, and encouraged everyone to do the same. The Trojan Women Project is committed to working in this spirit, encouraging all of us towards a collective vision of peace, hope, and the understanding that comes with hearing stories, making theater, and being together in one communal space.